When I was a young ambitious chef, I picked up a job as a commis (entry level cook) in Mallorca, Spain. During my first week, my new Head Chef Mike, told me to spatchcock 24 game hens before service. I had just returned to work, and there was only 15 minutes or so before the kitchen transformed into a form of organized chaos. I didn’t know how to spatchcock, nor did I know what the heck he was talking about. Mike was German, born and raised. He always said there was a strict military aspect to his kitchen, and he wasn’t kidding. Luckily for me, Mike was always willing to explain and show us how to do something once. If you didn’t get it the first time, at best you earned yourself a serious tongue lashing, which came with a rather abrasive German accent. After this you could consider your day ruined. We got those hens ready in time. Despite his aggressive kitchen demeanor, Chef Mike Gerhards and I remain great friends, and I consider him my most influential and respected teacher. What does it mean to spatchcock a chicken? 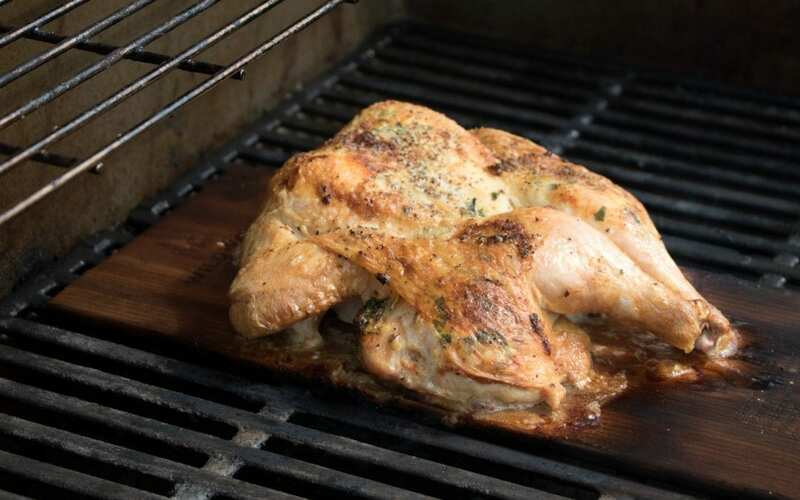 The English Oxford dictionary defines spatchcocking as a chicken or game bird split open for grilling. To the best of my knowledge, the term spatchcock is of Irish origin from the late 18th century. The term was formed from the phrase “to dispatch a cockerel.” Some say that the process is the same as the butterfly technique, but there are some differences. Butterflying involves a single, incomplete cut to open a chicken. Spatchcocking requires the removal of at least one bone, and more than one cut before the bird is flattened. Why should you spatchcock a chicken? Before I get into the process of preparing a spatchcocked bird, I would like to clarify the benefits of this technique. As you may know, dark and white meat require different cooking times. Flattening the bird exposes the dark meat to more direct heat and creates a more consistent cooking temperature. The process of flattening the bird also greatly reduces the amount of time it needs to cook. Although the dictionary definition mentions grilling specifically, this technique can also be done in an oven. Rinse and dry the chicken and remove any giblets. Place the chicken breast-side up on a cutting board and insert a knife into the neck cavity. With the tip of the knife coming through at the other end of the bird, cut downward to separate one side of the spine from the body. Repeat on the other side to completely remove the spine (this can also be done using a pair of kitchen shears). This next part is usually not included in most spatchcocking guides, but you’ll have less small bones to deal with if you follow these simple steps. Use a paring knife to trim down each side of the wishbones and pull them out. Cut the connective tissue between the ribs and the body and remove each side of the rib cage. In the center at the sternum where the breast bones meet, you will find a small piece of cartilage. Make a cut in this cartilage and you will be able to lay the bird flat. Now it’s time to grill or roast your chicken. Try our recipe for Cedar Planked Herb-Buttered Spatchcock Chicken with Tomato Salad. At this point you might not be able to spatchcock 24 birds in 15 minutes, but in the haunting words of Chef Mike Gerhards “Mach es einfach” (just get it done).